This quiz was a tricky sparrow but most people were able to figure it out! There are still several people that have answered all three of the quizzes correctly in this series. While most people were able to quickly figure out that this is a species of sparrow, figuring out which species was much trickier. This sparrow shows fine streaking on the sides which helps us eliminate a lot of species. It also has a white throat, malar, and eye-ring. This photo also shows a feature that is rarely seen on this species when it is not in flight, rufous lesser coverts. 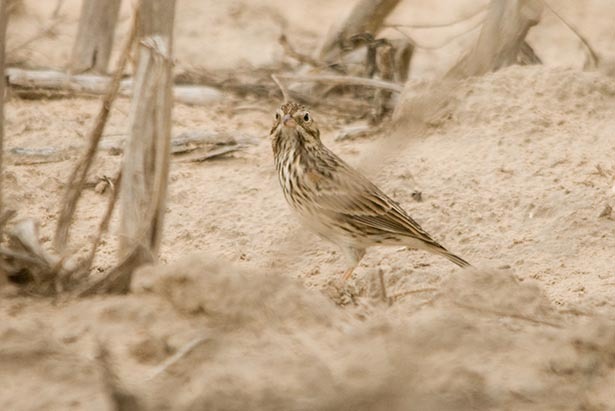 All of these features lead us to identify this bird as a Vesper Sparrow. The final quiz in the December series can be found here: http://nuttybirder.com/BirdQuiz/birdquiz.html#.UM_kKm9z6So.